My thoughts: For the King is a novel based on a real assassination attempt that took place on Christmas Eve in 1800 on Napoleon Bonarparte. Napoleon escaped by the hair on his chiny, chin chin , however many innocent Parisians died. Roch Miquel is on the case, but finding the truth is turning difficult with the intrusion of corrupt superiors in the police force and with his father falsely arrested as being part of the conspiracy. The novel centers on Roch trying to save his father quickly and find out what group was behind the assassination plot. Being a fan of mysteries and historical fiction I had high hopes for this book and while I liked it okay, for me it wasn’t a page turner. For one, it was tough for me to feel connected to the main character Roch, sometimes I liked him and sometimes I didn’t, though I did feel for his predicament and thought him a good and loyal person. He just didn’t resonate with me. There was also some confusion on my part for the scenes where Roch is at the police station - too many people to keep track of. 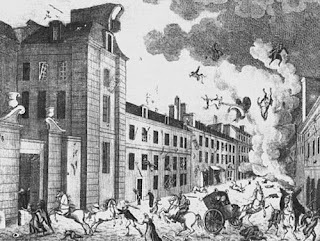 But, what I did like about For the King was the fabulous descriptions and the insight into the charged atmosphere of post-Revolutionary Paris. The struggle between the warring factions, the Jacobites, the Royalists and the Chouans and also the battle amongst the members of the police were fascinating and I liked how Catherine provided both perspectives for a more well-rounded view of the conflict. 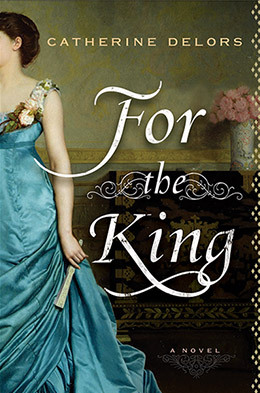 All in all For the King was a good read, especially if you enjoy detective stories with a historical spin! I enjoyed learning about this event in France’s history and am now on a mission to read more about this exciting time period. Delors is an amazing writer and for me, she’s one of the ones that whenever they release a new book you are super excited and can’t wait to dive in! I LOVED and highly recommend her first book, Mistress of the Revolution and look forward to more great reads by Delors in the future! I have 1 copy of For the King still up for grabs...click HERE to enter! Thanks for the great review, Amy! Glad you enjoyed post-revolutionary Paris. I echo your sentiments exactly! I will be reading this book as soon as I can get my hands on it. I appreciate the review! We wrote the same exact line in both of our reviews and gave it the same rating. Amy you amaze me each time I get a chance to read your reviews. You have a wonderful way with words. "I also got a little confused with all of the characters, mainly the ones that worked with Roch and the scenes at the police station". Yet another one to add to my wish list! I am going to be reading this very soon, and I am hoping that I have an easier time getting into it. I have heard that it is a bit had to connect with this one. I really enjoyed this novel...I felt like I had been set down in the middle of Post Revolutionary Paris. I loved the protagonist, Roch, but I loved every single minor character as well. I too would like to find out more about this time period and its events. I'll be reading her two books, I love historical detective stories.